Fine wale corduroy shirt ready for casual Friday’s or just hanging out with friends. Can be worn both as a shirt or a light jacket, the Merlon integrates two discreet hand pockets. One pocket even has a media port through which to pass your favorite headphones.Infused with the Arc’teryx commitment to function and freedom, the Merlon has articulated sleeves and gusseted underarms for freedom of motion, and twines elastane into the weave for stretch. Burly cotton/nylon canvas reinforcements protect the forearms and collar, and the chest pocket has subtle stitch-through detailing. The corduroy combines cotton’s comfort and breathability with the durability and moisture transport properties of polyester making this a highly functional shirt for the human powered commute. Arc’teryx is rooted in the alpine, but they know that daily life also moves quickly, so function and style are no longer mutually exclusive. Casual clothing or technical alpine piece, quality of materials, attention to craftsmanship, freedom of movement, purpose driven features and a streamlined aesthetic are the Arc’teryx genetic code. * Machine wash in warm water (30°C) or dry clean. * Arcteryx recommends that you wash the garment separately in cold water before the first wearing. Merlon LS Shirt - Mens is rated 4.5 out of 5 by 2. Rated 4 out of 5 by GregHill from great piece I was looking for a comfortable casual shirt, that cold take the beats and be a great all a rounder. 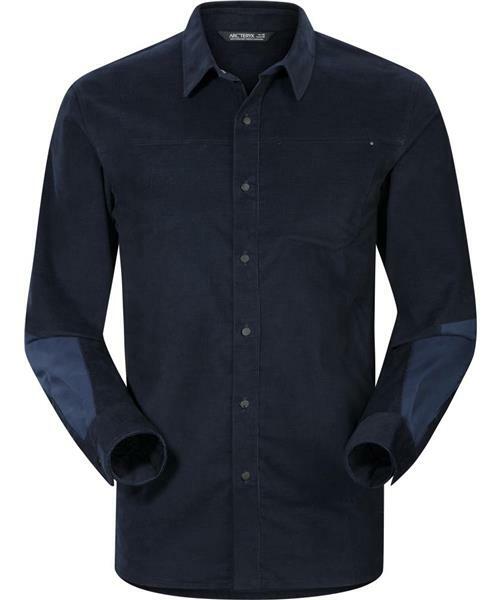 This shirt is just that,it has style but is also sturdy and perfect for any application. I didn't read about the discreet hand pockets and had no idea they were there. Until my hands naturally fell into them. That's how you know something is well thought out, when it just makes sense. My arms were hanging down and that all of a sudden my two hands were comfortably in the pockets. Its a great piece, it reminds me of shirts my dad used to wear for years. All around comfort and durable so it can be worn working around the house or heading out to the bar.